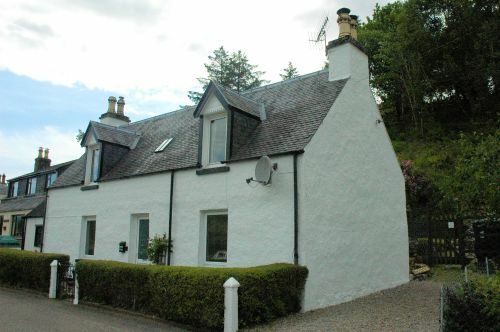 Bruaich Cottage is a tastefully modernised traditional Highland Cottage situated in Lochcarron, Wester Ross, in the North West Highlands of Scotland. Bruaich Cottage is situated on a quiet side road towards the west end of Lochcarron village and has superb sea and mountain views. Details of local amenities and directions to the area including a Google Map. 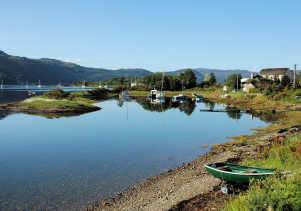 Lochcarron is an excellent base from which to explore both Wester Ross and Skye and Lochalsh. All our contact information including an On-Line Enquiry Form. Our holiday cottage is situated towards the west end of Lochcarron village and enjoys superb views of Loch Carron and the mountains to the south, looking across the water towards Attadale. The property stands on a quiet side road and is approx. 1 mile from the village centre where there are shops, pub and restaurants. 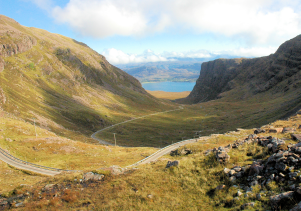 Lochcarron is an excellent base from which to explore the area with places such as Applecross, Shieldaig, Torridon, Gairloch, Plockton and the Isle of Skye all within very easy reach for trips out. The cottage has 2 double bedrooms and 1 small single bedroom and will sleep 4/5 people. Well behaved dogs are welcome by prior arrangement. We do not make any additional charge for dogs but request that you please keep your pet under reasonable control at all times. There is a fully enclosed garden to the rear of the cottage. Please note, however, that we cannot guarantee that the fencing is "dog-proof" and your dog should therefore be fully supervised whilst in the garden. This is especially important as there may be livestock in adjoining croft land. The cottage has full oil-fired central heating. The cost of heating is included in the rental. The cottage has been tastefully modernised as regards heating, insulation, decor and fixtures and fittings whilst still retaining its traditional charm and character. A free Wi-Fi Internet connection is provided in the cottage for the use of our holiday guests. There is off-road parking for 1 vehicle in the driveway to the side of the cottage. There is a further parking space at the roadside opposite the cottage. Bruaich Cottage is available to let throughout the year. For details of availability, please Contact Us. 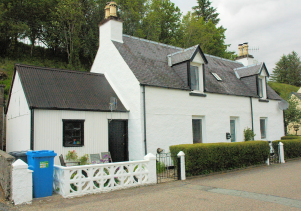 Use the links below to find out more about Bruaich Cottage and the Lochcarron area. See an over-view of the accommodation in Bruaich Cottage. Includes links to room-by-room descriptions and photos. Details of the facilities and amenities in the village - shops, pub, restaurants, etc. Also, some directions to the village, including a Google Map. Lots of information about things to see and do in the area with plenty of photos.